Welcome... to Blogtobia. : LINDSAY LOHAN: Worst. Thursday. Ever. PCN Photo // Used under agreement. 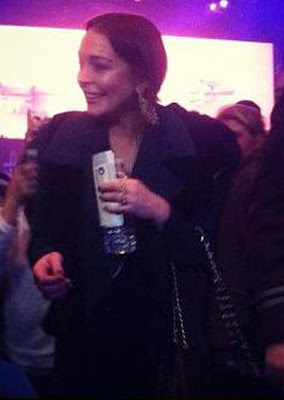 The LINDSAY LOHAN - in NEW YORK where she took in a SWAGGY BIEBS concert event - later went out to the club and allegedly decked some patron over some sort of shenanigans. The LiLO was then promptly arrested and locked up. Again. And now, we hear from the mighty TMZ that the LiLo may be facing massive charges today over that whole car-wreck thing which went down... including lying to the cops and more. But wait... it gets worse. She's on probation. Meaning she just effed up again while on... probation. Jail, party of ONE? Anyone? She just can't get a break. Click here for continuing team coverage of the LiLo Meltdown. PCN PHOTO // Tiffany Eve Mitchell, the alleged victim of the LiLo, leaving the NYC 10th Precinct. LiLo, with her bodyguard, covers up with a jacket while leaving the precinct. Wait, wasn't she supposed to be wearing an ankle bracelet?